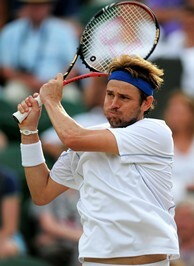 Mardy Fish next faces Rafael Nadal in the Wimbledon quarterfinals. WIMBLEDON, England - Mardy Fish has already accomplished his goal of reaching the Wimbledon quarterfinals for the first time, but now he must attempt to climb a much steeper mountain when he has to confront defending champion Rafael Nadal in the quarterfinals. Fish has never beaten Nadal in five tries, including a 3-6, 6-1, 6-4, 6-2 loss to him at the 2008 US Open. America's top-ranked player is saying that grass best suits his serving-and-volleying style, but Nadal clearly is comfortable on the surface having won the Wimbledon title in 2008 and 2010 and reaching two other finals in 2006 and 2007. He's also taken out Fish at 2006 Queens and in the first round of Wimbledon in 2007. The 29-year-old Fish is a substantially better player than he was back then, as he's more fit, has a better understanding of his game and has eliminated some of his weaknesses, but Nadal has improved too, which makes an upset of the Spaniard a monumental task. Fish must play the match on his terms and given that 10-time Grand Slam winner Nadal has turned matters his way time and time again since 2005 when he won his first major at Roland Garros, Fish is also going to have to adjust on the fly, just like he did in his 7-6, 6-4, 6-4 upset of 2010 finalist Tomas Berdych in the fourth round. "I think it's not having him take you out of your style of play," Fish said when asked what the key to confronting Nadal is. "I know my style can be successful on these courts. One of the things that these guys get you to do, and Berdych is the same way, is it kind of get you out of exactly how you want to play. Sometimes Rafa can play defense very well, and so you don't attack as much as you probably should. Or Andy Murray or Djokovic move so well or return so well that you over serve, things like that. You want to try to stay within yourself. I'll go into the match knowing my limitations, but trying to play as good as I can, 'cause I'll certainly need to." Fish has been as good as he's ever been on serve during the tournament, winning 64 of his 65 games. He has bombed 78 aces in four matches and has won 85 percent of his first serve points, better than anyone else left in the final eight, and has won a more than respectable 60 percent of his second serve points. Against Berdych, he nailed 42 winners and committed just 12 unforced errors. "He's playing fantastic," Nadal said of Fish. "I saw him a little bit against Robin Haase. He's playing at a very, very high level. He's a very dangerous player, so I will try my best to be very competitive on Wednesday. I need be at my 100 percent. If not, it's gonna be impossible against him. So I have to recover." No. 1 Nadal injured his left foot in his four-set win over Juan Martin del Potro and even though he has vowed to show up for his match against Fish, he may not be able top sprint at his normal speed. But the 2010 US Open champion Nadal has won plenty of matches when he hasn't felt perfectly, which means that Fish is going to have to show the Spaniard that he can sustain his attack over a long period. Nadal is very adept at grinding his opponents down, is a fantastic return of server and can exhaust anyone from the backcourt. Plus, he passes like a demon. Fish is going take a tremendous amount of risk and hopes that he can get into the Spaniard's head, something that no player outside of six-time champion Roger Federer has been able to do on the Wimbledon lawns over the past five years (Nadal was unable to defend his title in 2009 due to an injury). "I certainly do not feel really unbelievably happy to be here," said Fish, who will be at a career high No. 8 (or better) ranking when they are released next week. "I feel like it's not a complete upset that I'm in the quarterfinals of a Grand Slam. It feels a lot different. We'll come up with a game plan and we'll go into the match on Wednesday thinking I can make the semifinals of Wimbledon." Fish is hoping for super hot conditions like the ones that baked the courts on Monday, and according to the London weather bureaus, he may just get them on Wednesday. But what he does know is that his U.S. Davis Cup teammates in Andy Roddick and the Bryan brothers will be at least texting their support, as will his other player buddies such as James Blake, Robby Ginepri, John Isner and Sam Querrey. "These guys are some of my best friends," said Fish "If I'm not hearing from them, I'm not hearing from anybody." Most importantly, Fish has to take the same attitude into the match that Roddick has displayed at Wimbledon in reaching three finals: whomever you put in front of me, I have the tools to take them down. Nadal is one of the greatest players ever, but he is not unbeatable. "You can't go out there thinking you can't win," said Fish. "But I've never been past this spot in a Grand Slam. Past this spot is where I want to be, where you set your goals for. So game-plan-wise we'll come up with something. A lot of it's mental. So half the battle is walking out there believing you can win, and I'll definitely do that."